Mrs. Marietta Cube is the fourth hull in the winning SW100 RS mini-series and she is the result of the excellent collaboration between Farr Yacht Design for the naval architecture and Nauta Design for the general concept, interior and exterior design. 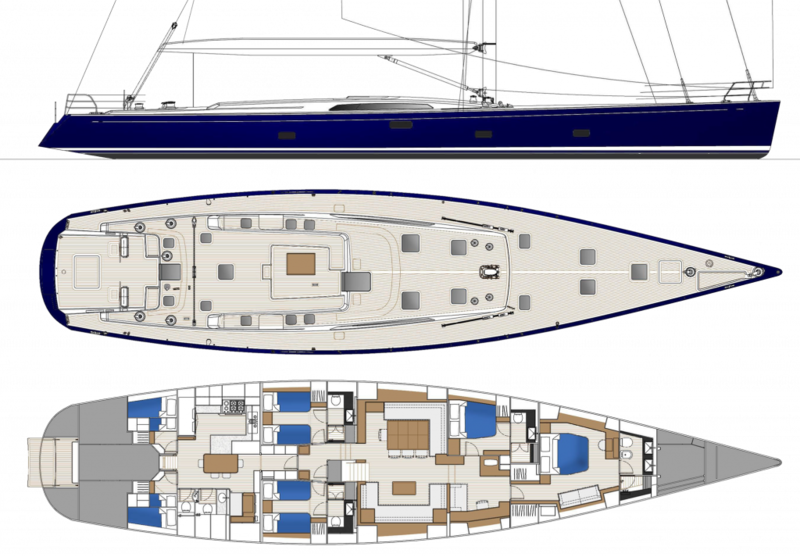 She is characterized by sporty lines of a low coachroof profile and an open transom. The yacht was laminated up through a process of vacuum infusion with advanced composite materials (carbon fiber, Kevlar, Corecell and epoxy resin). Her medium to light displacement means exciting sailing even in light breezes. Mrs Marietta Cube’s interior is elegant and exotic at the same time: furniture is in horizontally grained teak while colorful upholstery colors and decoration elements recall the South African soul and tradition. The interior layout features a clear separation between crew and guest areas for maximum privacy. The accommodation comprises two double twin cabins amidships and a VIP cabin further forward. The owner’s suite is forward in the quietest area of the yacht and features a vanity desk, a couch for two and a spacious en suite head with shower box. Mrs Marietta Cube features a generously proportioned full beam saloon, a large open space where eight to ten people can relax and converse in comfort on couches and as many again can be seated at the dining table. The crew area aft includes two cabins and a spacious galley; it is served by a dedicated companionway to ensure the privacy of owners and their guests.